Proteus Digital Health's CEO describes his company as providing a digital drivetrain for drugmakers to fundamentally change the rules of the game, just as Tesla's electric drivetrain has shaken up the car industry. The tiny ingestible sensors are the digital engine that will drive the humble white pill to deliver better care and better medication adherence leveraging mobile and cloud technology. It's not everyday that a digital health company compares itself to the most valuable car company in the world. But then, Proteus Digital Health is not exactly your run-of-the-mill operation. 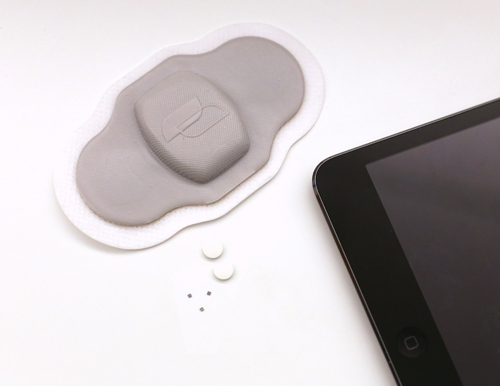 In 2012, the Redwood City, California startup received a 510(k) clearance for a miniature ingestible sensor which communicates with a wearable patch, and leverages mobile and cloud technology to let physicians monitor patients on drugs remotely, while helping patients to remember to take medications though an app that also helps to access patient data easily on mobile devices. Now the company is ready for prime time. On Sept. 10, FDA accepted a New Drug Application for what the company and its pharma partner Otsuka Pharmaceutical is billing as the first Digital Medicine - it integrates Proteus's FDA-cleared ingestible sensor right into the drug instead of requiring patients to swallow the sensor alongside their regular medication. If approved, the new drug will digitize Otsuka's blockbuster mental health drug Abilify, which earlier this year went off patent. With this drug-device combo product Proteus hopes to be the first company to answer that intractable question that has befuddled physicians for ages: Are patients taking their medications and if so is it working? In a recent interview, Proteus Digital Health's CEO, Andrew Thompson, described this capability of digitizing the humble oral medication and its potential to boost medication adherence, as akin to how Tesla is shaking up the auto industry. Tesla is a company that is showing the world what cars with electric drivetrains look like and their only partners are Mercedes and BMW, two of the most well-known car companies. They are now valued at more than GM and Ford combined. And the reason is because everyone thinks that Tesla is going to be the biggest car company in the world. It’s because everyone now believes that every car company in the world at the some point is going to want an electric drivetrain for their cars and they are going to get it from Tesla. Proteus is showing the world what drugs with a digital drivetrain look like. Our early partners are two of the most prestigious drug companies in the world - Novartis and Otsuka - and together they are showing the world what drugs with digital drivetrains look like and our job is here to have everyone figure out that eventually a lot of drug companies will want drugs with a digital drive train and we will be the company that delivers that technology. Otsuka Pharmaceutical is one such drugmaker betting on a digital future for medicines. The Japanese company also invested an undisclosed sum in Proteus. In an interview, Robert McQuade, the company's executive vice president and chief strategy officer, said that physicians would welcome the knowledge of whether patients are taking their pills regularly especially when treating patients with serious mental disorders. "When a drug for a serious mental illness doesn't work, you don't know why it doesn't work," McQuade said. "Does it not work because the drug doesn't work or does it not work because in the real world the patient didn’t take it? Now with this technology we will be able to answer that question and therefore give patients better care." This knowledge can also help physicians to change dosage or medications entirely whereas these decisions were prevously being made blind, Thompson pointed out. However boosting medication adherence can't simply be achieved by digitizing pills and integrating a sensor into the manufacturing process of a drug company like Otsuka. To patients, it still looks like the pill and they are not going to rush to take it per physician's directions if they haven't been doing the same for their regular medications. To boost adherence, the right patient engagement tools need to be created. And that is what McQuade and Thompson believe the Proteus platform offers through leveraging mobile and consumer technology. The patient facing app helps patients to keep track of their medications, steps, activity, rest and heart rate. Patients can also set medication reminders to help manage drug regimens. With the patient's consent, caregivers can know if their loved ones actually took the pill as was required and can nudge them to in case they forgot. "The digital [aspects] are the raison d'etre for this product," McQuade declared. "On any given day for a caregiver reminding somebody to take their medicine that they forgot is a simple thing to do. For a healthcare provider, they may look at a pattern of discontinuation and then contact the patient [to say] 'Why aren't you taking this product?'" Thompson described this social aspect and remote monitoring capability of the product as the digital patient engagement buttons that companies like Proteus can push to boost medication adherence. "So we got a very simple solution where patients and family members really like that it helps them to do a job that they are already trying to do which is make good health choices," he says. "It’s really important to understand that we are making use of very simple universal principles about human behavior." McQuade couldn't say how much would be added to the cost of making the Abilify drug in this new digital paradigm, saying it is too premature to speculate on cost. How the product would be reimbursed is also a question to be answered although Thompson sees a very clear value proposition for payers. "It’s important because nonaherence to medical therapy rights now costs the U.S. medical system $300 to $500 billion a year in costs associated with unnecessary interventions and procedures because patients don’t use their drugs," Thompson said. While medication adherence is hard to measure in a clinical trial — by its very nature clinical trials require regular visits with doctors who stress taking pills that can artificially boost adherence than in the normal, routine of everyday life — Proteus' system has shown improved outcomes. Thompson pointed to studies where patients with uncontrolled hypertension on more than two drugs for six months who were regarded as not responsive to therapy showed remarkable results when put on Proteus' therapy. About 40% of those patients were shown to have better control of their disease. "Most people would assume that it is an adherence effect but it certainly is a very powerful outcomes effect," Thompson said. McQuade is looking to bring this level of results to patients on Abilify. That can happen if FDA, who he described as very engaged and excited by this approach, approves the new drug application. That is expected to occur in April. "This is the first product that will actually be able to tell physicians whether the patient has been adherent or not," MCQuade said. "For physicians that’s just an enormous benefit." Hear from Jacques Ginestet, Head of Wearables Development with Proteus Digital Health, at the MD&M Florida Conference, Nov. 19 at the Orange County Convention Center in Orlando.